What is the Median of a Data Set? 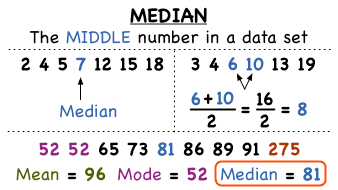 The median is one of many measures of central tendency. Check out this tutorial to learn what the median is and how you can find it! What is the Mode of a Data Set? Finding the mode of a set of data can help you understand the data better. This tutorial introduces you to mode and shows you how to find this helpful measure of central tendency! What is the Mean of a Data Set? When you think of the mean of a data set, think of the word average. 'Mean' and 'average' are the same thing when you're talking about a set of data! This tutorial introduces you to mean and shows you how to find it! How Do You Find an Average? What is the average temperature outside today? What is the average amount of time it takes you to do your homework? What is the average price for a gallon of gas? To figure out how to find the average to just about anything, check out this tutorial about averages! How Do You Find the Median of a Data Set? The median of a data set is the number that is the middle value of the set. It's easy to find the median if you first put the numbers in order from least to greatest. In this tutorial, see how to find the median of a data set, and see what to do if there are two middle values!